Unfortunately, to follow the news in French, this bilingual French English war and military vocabulary may come in handy. Watch out for the pronunciation since I hear many students mistake “la gare” (A sound = the train station) with “la guerre” (ay sound). This weird French word ends in a silent X, and is pronounced like “pay”. We talk about “des pourparlers de paix”, “des négociations de paix” = peace talks. La Marine nationale – the Navy (not the Marines, which would be translated as “les troupes de marines”… Note as well that “la marine marchande” is the ensemble of commercial ships. 6 – How do You Say World War I and World War II in French? We have several ways to talk about WWI and WWII in French. I wrote a whole article to talk about the French Terrorism Vocabulary – you’ll find more war-related terms there. 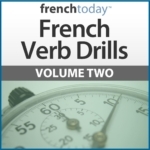 You may also be interested in D-Day – Le Débarquement and Vive la France – How to Express Patriotism in French.